"incidentally, this annual mock sacrifice of a large wicker-work figure (representing the vegetation spirit) may have been the origin of the misconception that Druids made human sacrifices. This charge was first made by Julius Caesar (who may not have had the most unbiased of motives), and has been re-stated many times since. However, as has often been pointed out, the only historians besides Caesar who make this accusation are those who have read Caesar. And in fact, upon reading Caesar's 'Gallic Wars' closely, one discovers that Caesar never claims to have actually witnessed such a sacrifice. Nor does he claim to have talked to anyone else who did. In fact, there is not one single eyewitness account of a human sacrifice performed by Druids in all of history! Nor is there any archeological evidence to support the charge. If, for example, human sacrifices had been performed at the same ritual sites year after year, there would be physical traces. Yet there is not a scrap. 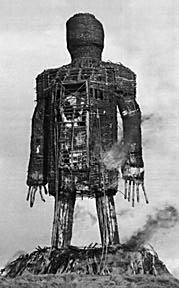 The Wicker man is an interesting image that has haunted our imagination since the first time Ceasar wrote about it in his "The Conquest of Gual". The Idea of a wicker man was meant to haunt the images of those who might ever want to sympathise with the Celts and instead sway the mind of all who read to see them in the worst light. No evidence of a Wicker Man(or wicker anything used for sacrifice)has been ever been found but many people believe that it is something real that they can comment on with impunity. Many Christian webpages list it as fact without because it is an effective tool. I DO though maintain that they did not use Wicker Men..for Human Sacrifice or to Toast Marshmellows,and until Archeology proves otherwise,that is my take on it. Also: Wernick, Robert. "What Were the Druids like, and was Lindow Man One?" Smithsonian (March, 1988): 146-66. Turner, R. C. and R. G. Scaife. Bog Bodies: New Discoveries and New Perspectives. British Museum Press: London, 1995. "[6.16]The nation of all the Gauls is extremely devoted to superstitious rites; and on that account they who are troubled with unusually severe diseases, and they who are engaged in battles and dangers, either sacrifice men as victims, or vow that they will sacrifice them, and employ the Druids as the performers of those sacrifices; because they think that unless the life of a man be offered for the life of a man, the mind of the immortal gods can not be rendered propitious, and they have sacrifices of that kind ordained for national purposes. Others have figures of vast size, the limbs of which formed of osiers they fill with living men, which being set on fire, the men perish enveloped in the flames. Traditions of Bonfire Night Part 3: The 5th November is a night for bonfires, toffee and fireworks King James I declared 5th November a public holiday and the first known bonfire celebrations took place in 1607. The 5th of November festivities and effigy-burning are derived from the king's Act of Parliament ruling that the foiling of the Gunpowder Plot should be celebrated every year. At one time professional bonfire builders, who specialised in erecting hilltop beacons, would be kept busy on this date. Previously, bonfires had undoubtedly been lit at the turning points of the Pagan year, but the fires of this particular night are thought to have originated from the Hallowe'en fires of north-west England. A Guy (effigy), fireworks and torch-lit processions are popular on this night, and children traditionally collect money ("a penny for the Guy") for fireworks by making a scarecrow-like model in the image of Guy Fawkes. There are also many rhymes associated with the Gunpowder Plot and children in some areas blacken their faces and play lucky stones. The Pagan Mens Group that I belonged to, called Samildanach had used the wicker-man in our yearly celibrations. This is something that we had decided on late in the season, and had much success with it. We built,grew and cut down the Green Man/Wicker Man that we have named "John Barleycorn". We later burnt him at Samhain. I have left the group,but I still practice this myself at my home. Building the Wicker Man/Green Man/John Barleycorn witht he kids is fun,and I enjoy talking with them about it,and working with the plant material that surrounds the wooden frame. "Caesar wasn't the type to retail wild stories. On the other hand he evidently hadn't witnessed a wicker man sacrifice himself, and as far as I can tell no other classical author mentions it. So it's hard to say how common this practice really was." Cecil AdamsThe Straight Dope Wicker Man The Movie "Flesh to touch...Flesh to burn! Don't keep the Wicker Man waiting!" In 1973 The image of "The Wicker Man" entered our consciosness via the film "The Wicker Man". The Film was about the dissapearance of a young girl from the remote Scottish island of Summarisle,and when the deeply Christian Sergeant Howie is sent to investigate, He's appalled by the community's neo-pagan ways and their open displays of sexuality. He comes to suspect that the missing girl has been sacrificed by the locals - but there's much worse horror waiting for the devout and virginal Sergeant Howie. Christopher Lee and Edward Woodward give superb performances. The Star of the Movie though is the "Wicker Man". Seen for a few minutes at the end of the film,the Wickerwork basket man is used to imprison St Howie (Woodward),and several barnyard animals as a sort of Lankashire hot pot for the gods. The imagery is striking,and left a imprint on those who had seen it,and those who heard about it via word of mouth. A Burning Effigy Party:Family Fun!